Komandor makes Toronto’s highest quality closets, sliding doors, and custom cabinetry. Our products set the industry standard for quality, performance, durability and added value because we oversee every aspect of their design, production and installation. Using Computer Aided Design, and employing precise production techniques, Komandor’s quality products are built to last, and designed to compliment your home or condominium. No other Toronto closet company can come close to offering Komandor’s level of client service and quality workmanship. Used during an onsite consultation, our designers will survey your interior space and create a 3D virtual model of your environment based on existing field conditions. 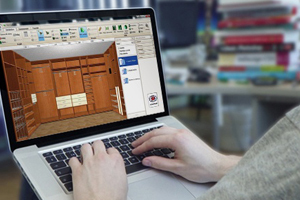 Smart Designer, is a fully integrated CAD/CAM, MRP software package developed to give clients the peace of mind other supposed custom closet companies cannot. Every nook and cranny of your space will be noted to ensure nothing is left to chance. From there, you are free to design your space with an endless array of custom solutions, accessories and finishes. Most importantly your project’s estimate is updated in real time as well. No hidden, or surprise fee here! Not only will Komandor Designer show you how your final space will look, complete with finishes and accessories, but the measurements generated will be used by Designer’s production module to fine tune the fabrication of your custom design. This ensures measurements and field conditions, such as slopped floors are taken into account during the manufacturing process. Designer is also able to propose the most cost effective and efficient means to install your final product. Komandor Designer equals high quality cost-effective designs that are produced to your exacting requirements. When off-the-shelf won’t do, consult a Komandor designer and have them unlock the true potential of your space with Komandor’s Smart Designer.